In the space of 5 years, Evolution Mining has become the second largest gold mining company listed on the Australian Stock Exchange, with six wholly owned operations spanning the east and west coasts of Australia and holding an economic interest in a seventh operation. Evolution Mining produced an astounding 804,000 ounces of gold in the financial year of 2016 and, despite the divestment of a seventh wholly owned operation in September 2016, with the recently acquired economic interest, Evolution is extending its commitment to the Australian mining industry, forecasting a production high of 860,000 ounces of gold in FY 2017. 467km west of Sydney lies a small town known for its gold discovery heritage, dating back to 1893- West Wyalong NSW. This is where Evolution’s flagship site - Cowal gold mine is located. Where it produces a staggering 240,000 ounces of gold per year, equating to about 30% of Evolution’s total gold output. This impressive amount of gold production places the Cowal operations, as one of the largest open pit gold mines in Australia and one of the core operations for the business. The mining operation produces from a number of different faces within the single pit. Its benches are 9m in height and are mined as 3m x 3m flitches. Ore is then hauled by truck from the pit face to either a stockpile area or directly fed into the primary crusher, which forms the start of the gold processing plant. 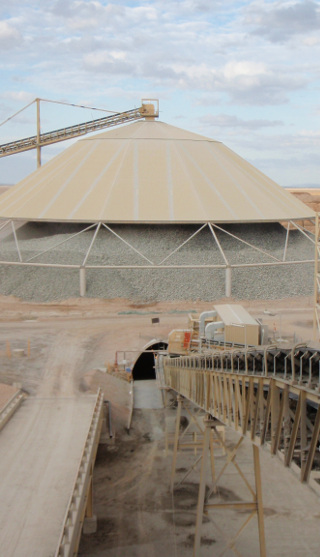 Commissioned in 2006, the Cowal gold processing plant consists of crushing, two stage grinding, sulphide flotation, regrind and Carbon In Leach (CIL) recovery. The gold processing plant currently processes an impressive 7.5 Mtpa and in June 2016 approximately 2.7 million ounces of gold had been produced as a result. Since 2006, Cowal has continuously optimised their process automation system, increasing their production output by a staggering 220%. The complete gold processing plant from the primary crusher through to the gold refinery is controlled and monitored using an incredible array of distributed control system technology. More specifically using Yokogawa’s CENTUM VP DCS, designing in 9x high availability CPU’s pairs (18 CPU’s in total) which processes in excess of 4200 hardwired IO points. Not including a surplus of 20 CENTUM VP communication modules talking to a mix of Profibus DP, Ethernet/IP, Modbus TCP and Serial (RS-485) protocols that allow external peripheral field devices and switchgear to be brought into the CENTUM VP eco system. The plant system is fully visualized over 6 CENTUM Human Interface Stations, allowing operators a complete insight into day to day operations. In addition, remote monitoring of the complete process control system is achieved using CENTUM VP HIS-TSE, accessible by both fixed and mobile devices. currently being used to process over 30% to Australia’s total gold output, placing it in the enviable position as the control system standard for gold processing. "The unprecedented reliability and availability of the system, ensured zero unplanned downtime, since the site was commissioned 10 years ago.